Any auto extends liability coverage to any vehicle, owned or non-owned, while in use by your business for business purposes. This may include leased, rented, borrowed, or hired. It also covers use of personal vehicles of owners or employee vehicles used for business related purposes. The coverage usually extends to any new vehicle purchased for up to 30 to 60 days. Trailer interchange insurance is an endorsement that can be added to a truckers policy. This endorsement provides coverage for damage done to a trailer belonging to someone else while being pulled by an insured truck (tractor). If your vehicle is inoperable due to an accident or other covered loss, this coverage is designed to get you back on the road and back to work as quickly as possible. Options include simply covering the cost of an appropriate rental vehicle to reimbursing lost income due to vehicle downtime. If an accident or other loss occurs that involves multiple vehicles covered by your commercial auto policy, you would only have to pay one deductible with this option. Protects individuals who have company-owned vehicles they use for personal or non-business purposes. Extends protection to a personally-owned vehicle if an accident occurs when the driver is in transit for business purposes (not including commuting to and from work). According to the Bureau of Labor Statistics, motor vehicle accidents are the number one cause of workplace fatalities. Help lessen the risk of these accidents occurring by promoting safe driving practices among your employees and remind them that their safety is your top priority. Seat belts are the most effective safety device in vehicles, and, when worn properly, they can reduce the risk of crash injuries by 50 percent. Seat belts save lives. During a crash, anyone not wearing a seat belt will slam into the steering wheel, windshield, or other parts of the interior, or be ejected from the vehicle. Passengers not wearing seat belts become a risk to other passengers in the vehicle who are wearing seat belts. 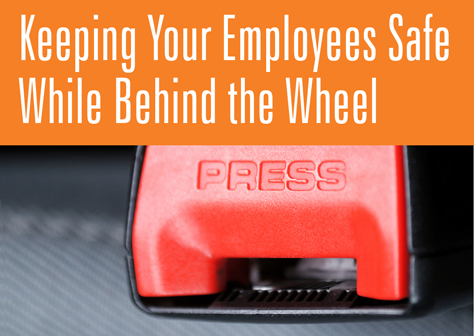 Encourage your employees to always use a seat belt, no matter the length of the trip or the area they are traveling in – an accident can occur anywhere and anytime. About 25 to 30 percent of all vehicle accidents can be attributed to distracted driving. It is critical that you stress to your employees that when driving for work, safe driving is their primary responsibility. While behind the wheel, the driver’s full attention should be devoted to safely controlling the vehicle. The use of cell phones, reading, personal grooming, and other distracting activities should be avoided while driving. During a crash or when making sudden maneuvers, unsecured items can move around or become airborne, injuring the driver and any passengers. Secure all tools, equipment, and other objects properly to prevent unsafe movement during travel. person’s ability to drive safely is severely impacted by alcohol, certain prescription drugs and over-the counter medications, and illegal drugs. Alcohol alone is a contributing factor in 39 percent of all work-related vehicle accidents. Complete avoidance of these impairing substances will help your employees to maintain alertness, concentration, and coordination while driving. Fatigued or drowsy driving may contribute to more than 100,000 vehicle accidents each year, resulting in over 40,000 injuries and 1,550 deaths. Employees should be well rested, alert, and sober on the road so that they are in a position to defend themselves from drivers who do not make the same choice. Encourage employees to get plenty of sleep the night before traveling, take regular breaks on long trips, stop and rest when tired, and share the driving when possible. Medications that may cause drowsiness should also be avoided. Bottlenecks and traffic delays can create a high level of frustration that may spark aggressive driving behavior. The roadway is one place that being aggressive never pays. Aggressive driving includes excessive speed, tailgating, failure to signal a lane change, running a red light, and passing on the right. Employees can minimize stress while traveling by allowing plenty of time to get to their destination and by planning their travel to avoid rush hour when possible. Encourage courteous driving behaviors including traveling a safe distance behind other vehicles, using the horn sparingly, using signals to indicate turns and lane changes, and not blocking the passing lane. The best advice is to avoid engaging in conflict with other drivers and to allow others to merge.